The duality of Alakshmi fascinated me. For if the Amritha or the nectar of immortality emerged when the Ocean of milk was churned so did the pollutant Halahala or the cosmic poison. 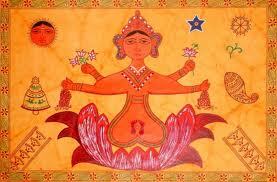 The Vaishnava legends claim that Alakshmi the twin of Lakshmi is the embodiment of Halahala. She is the goddess of misfortune and strife. She is fond of pungent and sour things, hence if Lakshmi is welcomed into the house by keeping the sweets inside for her, she satiated by the lemon and chilli strung outside. Satisfied she turns away unless she is appeased Lakshmi is not. If one were to take our own internal journey as the turbulent churning of the Ocean of milk, then our negativity is Halahala, unless we acknowledge, respect and accept it, we cannot move to abundance. Hinduism does not deal with evil, or rather there is no concept of evil. The positive and negative are both acknowledge, respected but only one is welcome. Categoriesabundance, mythology, Reluctant Hindu, Rhythm Indiana Tagsalakshmi, jyeshta lakshmi, lakshmi, nectar, plinky prompts, poison.